Consumer sentiment dropped to a six-month low at the beginning of July. June's early reading was the highest it has been since March, moving opposite of expectations. The report considers consumers' attitudes about economic prospects. Consumer sentiment dropped below expectations at the beginning of July to a six-month low on rising fears regarding the Trump Administration's trade battles. Consumer sentiment fell to 97.1, according to the University of Michigan's monthly survey of consumers. Economists expected a reading of 98.2, according to Reuters. "The darkening cloud on the horizon, however, is due to rising concerns about the potential negative impact of tariffs on the domestic economy," Richard Curtin, Surveys of Consumers chief economist, said. 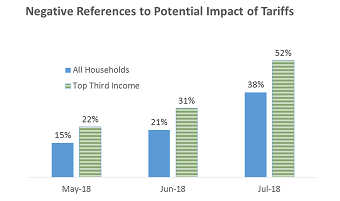 Over 50 percent of those in the top third of the income distribution cited escalating trade tensions as a reason for a future decline in the pace of economic growth and an uptick in inflation. The top third of the income distribution accounts for half of consumer spending. In the most recent trade spat, U.S. President Donald Trump proposed a 10 percent tariff on Chinese goods which value $200 billion in trade annually. June's preliminary reading was the highest the measure has been since hitting 101.4 in March, more than a point above May's reading of 98.